The celebrations continue in the auction room for International Women's Day, as a pair of unworn Suffragette stockings will go on sale next month at Tennants. Founded by Millicent Fawcett, the National Union of Women’s Suffragette Societies, of the late 19th century, represented mainly middle and upper class women frustrated by their social and economic status. 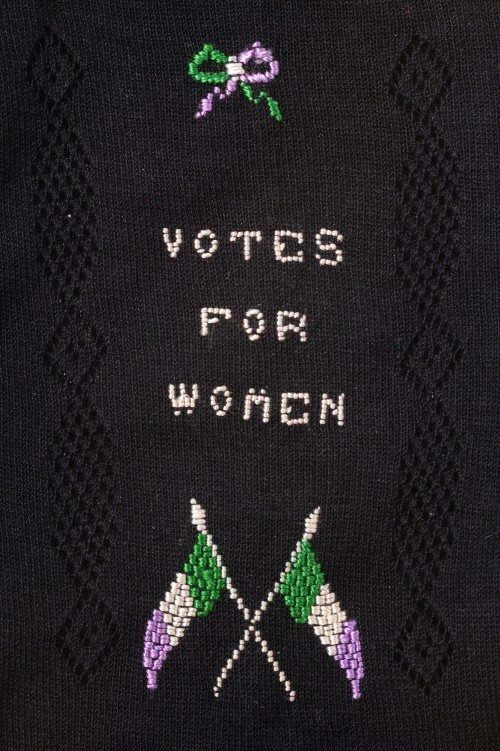 Millicent’s aim was to seek the right for women to vote, through organised peaceful protests and constitutional campaigning by issuing leaflets and presenting petitions. Unfortunately, progress under Millicent was slow moving. As a reaction to the feelings that little was being done for women by women, The Women’s Social and Political Union was established under the leadership of Emmeline Pankhurst. This movement was fast-paced, radical and militant in their approach. Suffrage was not officially achieved, whereby women obtained the same rights as men, until 1928. A number of items were produced to promote the WSPU, for members to wear either during demonstrations or at other times. These included silk motor scarfs, protest sashes, enamel badges, beaded necklaces, rosettes, stockings etc. They always included the three colours of the Union, which were purple, white and green, which symbolised dignity, purity and hope. The stockings are circa 1908-1910 and have a pre-sale estimate of £400-600, however, thanks to the latest silver screen tribute Suffragette, the stockings could climb up the ladder and smash this estimate. Tennants Vintage Costume, Textiles, Dolls & Teddy Bears will take place on 29th April, 2016.